James had a passion for art ever since he was a young boy. With his creative mind, he’s constantly creating things with his hands. 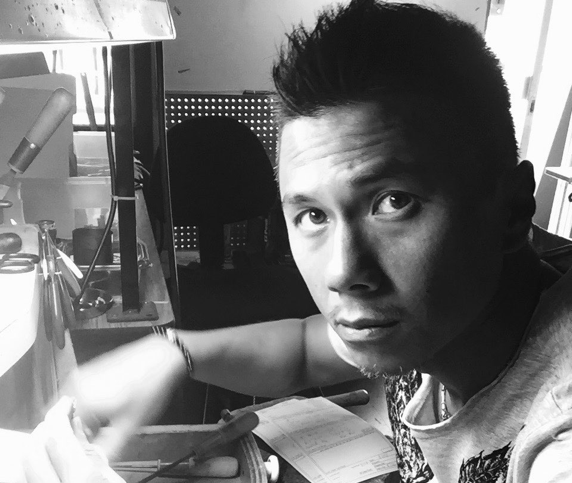 As he grew older, that enjoyment of creating works of art has led him to learning the beautiful craft of Hawaiian Jewelry, which he learned in the early 90’s. James constantly traveled to Japan, always striving to obtain new ideas which he can incorporate in his works of art. Loaded with an abundance of ideas. James went to work for his friend in Tokyo at a clothing design company. As an apprentice, he learned how to use computers to aid him in design and help express his vision. In 2001 he started working for Maxi, A very well known jewelry brand in Hawaii and　Japan. For three years, he worked with Maxi’s designer Howard Miao, who gave him the opportunity to experiment with a wide array of designs. LeiLei work shop was established in 2004. LeiLei started as a Hawaiian jewelry manufacture factory, manufacturing Custom Traditional Hawaiian Heirloom Jewelry. Since the demands for shop got greater, LeiLei shop was opened in 2005.